The Kenwood Interdisciplinary Research Complex is instrumental in fulfilling the University of Wisconsin-Milwaukee's mission to "be a top-tier research university that is the best place to learn and work for students, faculty and staff." It addresses the most urgent academic and research needs in the fields of science, technology, engineering, and mathematics, in addition to creating a new home for the department of physics. The first new academic building to be added to the university's main campus in more than a decade, it will also be the largest structure at UWM and includes offices, instructional areas, collaborative spaces, multidisciplinary research labs, greenhouses, and shared core facilities. A portion of the building will feature facilities for the Zilber School of Public Health that can be shared by other departments. Its indoor pathway is woven into a major pedestrian throughway, seamlessly connecting the building to future phases of the quad and the rest of the campus. As an instructional space, the greenhouse will serve roughly 1,700 students throughout the year. Abundant examples of plant physiology, biodiversity, and evolution provide an ideal learning space for classes at all levels. Situated on a rooftop that affords plentiful sun exposure, this new greenhouse for the Department of Biological Sciences replaces two outdated campus greenhouses. 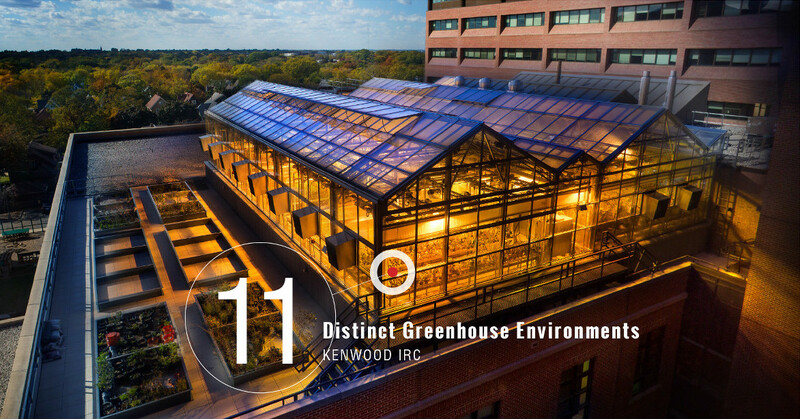 Constructed as part of the Kenwood IRC project, the state-of-the-art facility supports both undergraduate and graduate education as well as funded research. The setup of this facility is fairly rare. Many greenhouses even at major universities, keep their entire collection in a single open space under the same conditions, compromising the needs of a huge variety of plant life with a middle-of-the-road approach. In contrast, this greenhouse has eleven separate growing environments that are designed to support distinct conditions with controls for light, temperature, air flow, humidity, and carbon dioxide. "We can design an environment that the faculty want versus the faculty needing to design their research around the environmental conditions," says greenhouse manager, Paul Engevold.